A couple of weeks ago, I had an unfamiliar experience. I was kept awake all night by my phone buzzing, indicating one of my tweets was being shared and commented upon around the world. The subject? 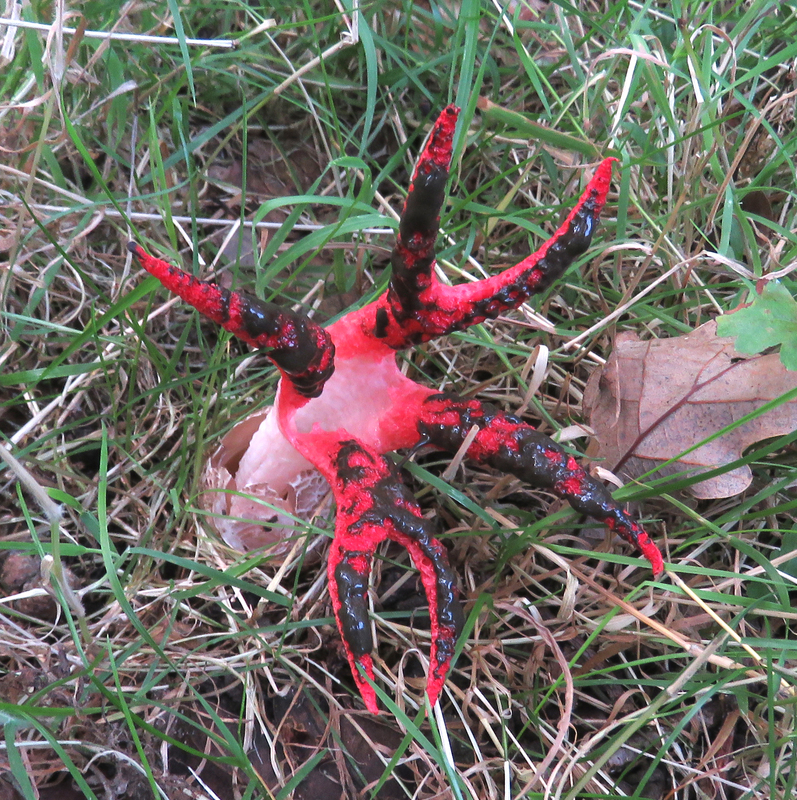 A wonderful, smelly, alien-looking fungus – the Devil’s Fingers. 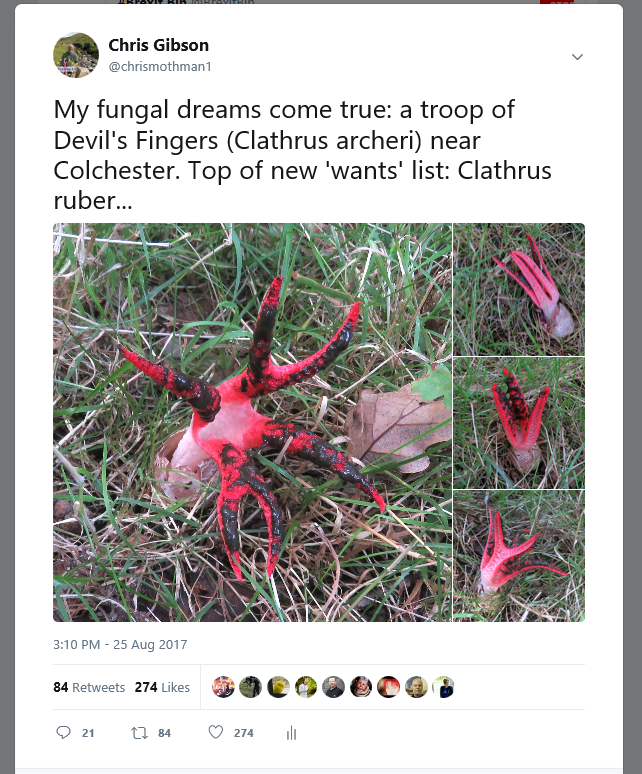 Alerted to its occurrence near Colchester by a Twitter contact @MushroomTable, Devil’s Fingers now ranks high as one of my most exciting wildlife sightings ever. Not native to the UK, this Antipodean monster arrived in Britain around a century ago, its spores having reached our shores it is believed either via the horticultural trade or perhaps on the tyres of military vehicles. It has been established since then in climatically-favoured parts of the south-west, but is now evidently spreading, perhaps yet another indicator of climate change. Why it attracted so much interest is not difficult to see – it is a very striking species – but what interested me was the extent to which it captured the attention of the Twittersphere. By now, it has gathered nearly 21,000 page impressions, of which more than 2,000 viewers engaged with it. 274 likes, 84 retweets, 21 replies – by a very long way the most popular tweet I have ever posted. Perhaps more significantly, it encouraged 75 viewers to look into my profile, and (at least temporarily) I gained around 30 new followers. Of course, whether those followers will stick with me is a different matter: when they realise that much of my Twitter activity is around sharing my concerns about the horrors of Brexit, should it happen, and highlighting human abuses to animals and the natural world generally, some have and will no doubt continue to drop away. But for that I make no apologies: those issues are important to me and part of my very being. And on that point, I have noticed a lot more interest in my more political tweets subsequently.